Haven’t we seen this GOP move on Barack Obama before? In 2004, when Obama was running for the Illinois Senate seat, the GOP sent in their “race” candidate Alan Keyes, to shake up “identity” voters whom they assumed would find Obama too “foreign” or his name too difficult to pronounce. We now see how effective that strategy was. However, in the Alan Keyes Archives is the debate between the two then Senate candidates on October 12, 2004 which is fascinating in and of itself, and confirms what I’ve said all along; Obama really has been consistent on many of his positions if anyone cares to pay attention or read his book The Audacity of Hope. But now we have another version of that 11th hour scenario with Sarah Palin, governor of the great 49th state of Alaska. Just 3 months shy of her 2nd year as governor, Palin has been tapped to potentially be one heartbeat away from the highest office in the free world. Since I and many others know so little about her, and she hasn’t written any autobiographies, out of fairness, you can link to her official bio: http://gov.state.ak.us/bio.html. And here’s a link to the Anchorage Daily News. 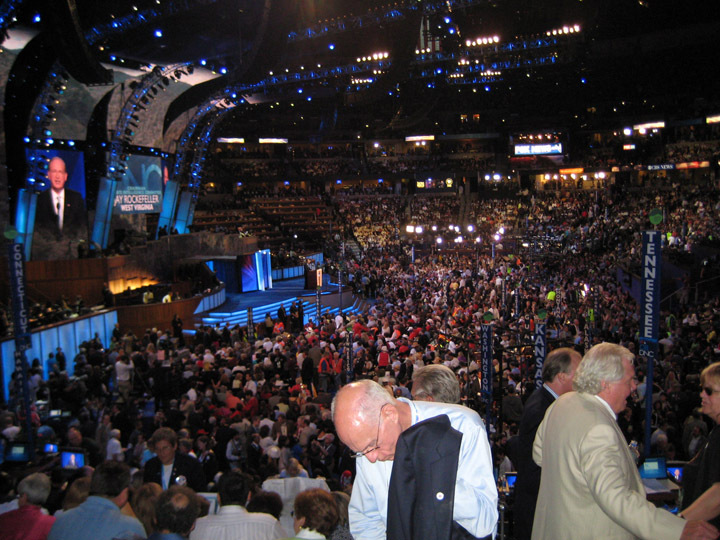 Obviously, this move gets press and takes the spotlight off what many describe as one of the most successful DNC conventions, if not the best ever. And of course in true form and for the sake of drama, the media and Palin herself are feeding this through the prism of what it means to disaffected HRC supporters. Will Palin bring in the anti-choice, evangelical base within the Republican party? Will she appeal to Log Cabin Republicans? Will soccer moms trade in their kid’s cleats for ice skates and hockey sticks? Will the fellas make her the first pin-up candidate? I’m not making that one up based on the comments in the blogsphere. LAINE HANSON: The church I go to is the one that emancipated the slaves, that gave women the right to vote, that gave us every freedom that we hold dear. My church is this very Chapel of Democracy that we sit in together, and I do not need God to tell me what are my moral absolutes. I need my heart, my brain, and this church. Hurricane Gustav may blow this story off the page for a second, but even in that context, Palin shouldn’t be ignored. Home again — after an all-nighter to guarantee I arrive at the Denver International Airport at 3:30 a.m. for a 6:15 a.m. flight. Last night completed a week I will never forget. 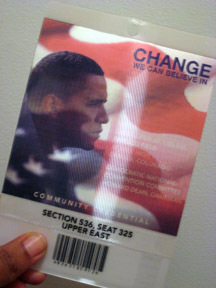 This ticket to the INVESCO field for Barack Obama’s acceptance speech was my final goal for the non-stop DNC convention. All is forgiven (see previous post). Kim Morton, who is running for DC’s Democratic State Committee (September 9 vote) and chair of DC for Obama met me at another designated “drop off” point with the plastic hologram stamped ticket of admission. These tickets were released to delegations early Thursday morning. After driving in and parking downtown, our group jumped on the 16th Street Market bus, then onto a light rail at Union Station. After a quarter+ mile moving line, we finally arrived at the stadium. There were people outside the secured area still seeking tickets, holding up fingers for 1 and 2. Free bottled water was available along the foot path. We had to split up to find our seats. 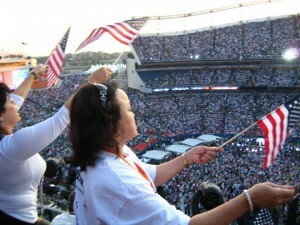 Seriously, what were the chances we would meet again in a crowd of 80,000 (per estimates)? Would we see each other on the screens as cameras panned the sections, or standing up in “the wave” that circled the stadium several times. But overall, the process of getting in and out was orderly. Even with the star entertainment like Sheryl Crow, Stevie Wonder, and (I’ll add) Al Gore, my main purpose for being there was to hear Senator Barack Obama accept the nomination for POTUS. For months I’ve been anticipating my cathartic reaction to this historic occasion; but it didn’t happen at INVESCO field. Perhaps it’s because for me the game isn’t over yet. If anyone thought Barack Obama was not up for a fight, his acceptance speech on the Bronchos 50 yard line put that assumption to rest. This candidate is definitely up to the task of fearlessly tackling his opponent. John McCain has voted with George Bush ninety percent of the time. Senator McCain likes to talk about judgment, but really, what does it say about your judgment when you think George Bush has been right more than ninety percent of the time? I don’t know about you, but I’m not ready to take a ten percent chance on change. John McCain likes to say that he’ll follow bin Laden to the Gates of Hell – but he won’t even go to the cave where he lives. Yesterday, I had to be queen of the hustle. I was determined this was going to be a make-or-break day. The goal was to get that “credential” to get into the Pepsi Center and see the hall of delegates, state signs, the funny hats. And YES! I got in. Somehow, on this mission, I got side tracked by a Hillary Clinton press conference in the Colorado Convention Center where she released her delegates – 1,920 committed delegates, according to CNN, she mentioned in her remarks along with stating she won’t “tell anyone what to do.” Her core message was party unity, beat John McCain following up on a great speech from the night before. 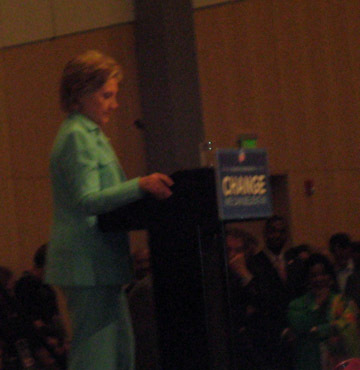 I talked with one of her delegates at the CBCF (Congressional Black Caucus Foundation) party the night of her speech who said he and other delegates were prepared to make a symbolic visual transition to Obama on the convention floor Thursday during the roll call. Somehow that roll call didn’t happen. Delegates cast their votes Thursday afternoon. I’m trying to chase down the real tally because one thing I’ve learned here is the news I’m getting on cable and network television and radio is often wrong and intended to build on hype. I’m still on news black out btw. Best to put my ear to the ground, talk to people, and observe. More on that press conference in a later wrap up post. I detected a bit of a wink in the remarks. Hopefully I can share the audio from the Flip camera I had. I was happy to say that press conference led me to the Gulf Coast people. Lauren Anderson with the Equity and Inclusion Campaign and Jacques Morial of the Louisiana Justice Institute. All eyes are on hurricane Gustav at this time. Lauren and Jacques were very worried about what this will do to the modest Katrina recovery efforts made to date and the people along the Gulf. Please visit their sites for more information. But Thanks to the DC Delegation (DC4ObamaBeatsMcCain), I got a “credential” to get me into the Pepsi Center for the final night at this location before Barack Obama makes his acceptance speech at INVESCO Field. How did I do it? After a bit of lecturing by a friend, I had to put myself in the right place and hopefully the right time and person would present itself. Ask people. The magic moment happened on the 16th Street Mall bus. Frank Smith of the African American Civil War Museum in DC invited me to join several other DC delegation members at the “drop off” point inside corner pizza joint/bar. Kudos to Arrington Dixon, former DC City Councilmember-At-Large. Apparently Arrington Dixon’s mission was to get as many DC delegation and DC folk into our section of the hall for the BIG Thursday Night. Bill Clinton, John Kerry and Joe Biden were on the bill. And for those of you who didn’t stay up after Biden’s Vice Presidential acceptance speech, a surprise appearance by the candidate himself, Barack Obama. Oh, I get it. The element of surprise. Conflict. Drama. Shock and awe. That’s what he’s looking for. Maybe that’s why we’re hearing so much news about Bill Clinton raising hell over suggested changes to his speech. Maybe it’s just Bill being Bill for better or worse. Let’s face it, he’s on purpose regarding his legacy after a pretty rough and tumble primary with Hillary. But since there’s “no news here,” let’s count on our old faithful—the Clintons—to give the newsmakers the drama they crave. Unfortunately, at the end of the day, I did log on and saw that the FBI thwarted a possible assassination attempt by white supremacists on Barack Obama’s life. The DNC or any political convention on this level is the ultimate stage for anyone who has a platform, agenda, gripe, purpose or passion. It’s pure theater in the raw and everyone’s more than willing to be players. Most of my convention script has been dramatically altered. I’m one of 20,000 volunteers (per someone’s estimate) who came out willing and eager to help out for the cause yet derailed by the bureaucratic and unpredictable DNC machine and their moving parts. Only one member of our group got “credentialed” to work inside the Pepsi Center. This was set up before I got on the plane but I didn’t know what awaited when I touched down. Several of us came to work with media. I was told Monday by our point person who made the arrangements “I can’t make any promises.” So we’re on our own. More on the “credentials” later. But I’ll be moving out of Boulder and heading to Westminster today to volunteer with the Congressional Black Caucus Foundation. I’m joining three other friends I’ve known for years who came in with the CBC. At the moment, getting back on my purpose has been my story and drama since yesterday. One person in our group who’s turned this thing around is Todd Steven Burroughs. Todd drove with our point person from DC to Boulder. He expected to volunteer, but he had a personal agenda as well. Todd is a journalist and lectures at Morgan State. 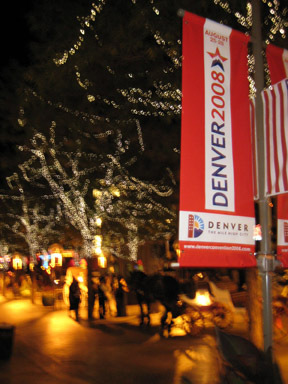 We decided to just go to the Colorado Convention Center in Denver where he could collect interviews for an article and I could watch the drama unfold among the delegates, hot shots, vendors, demonstrators, and security as well as catch up with the DC delegation. 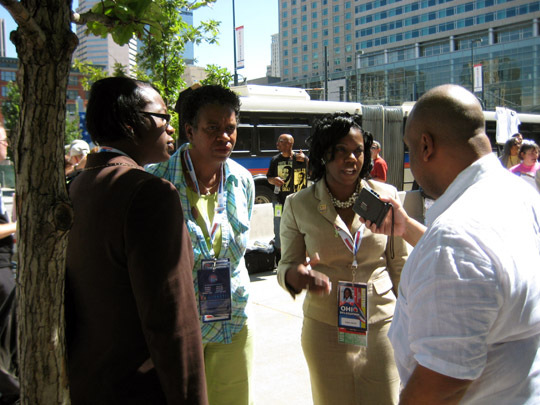 Todd’s first interview was with a group of delegates from Cleveland, OH where the late Congresswoman Stephanie Tubbs Jones represented. Rep. Tubbs Jones died suddenly last week of a brain hemorrhage caused by an aneurism. One of the Ohio delegates was wearing a button for Tubbs Jones. Being a graduate of Oberlin, I’ve always kept an interest in the goings on of Cleveland and Lorain County, OH. In the heat of the primaries I heard Tubbs was getting some flack about her support for Hillary Clinton. These delegates from Obama certainly didn’t mirror that story. These women delegates are definitely on purpose with a passion. Stephanie Tubbs was a sister and always will be. Sorry, Michael Eric Dyson and former Essence editor-in-chief Susan Taylor. Dyson had his arm around Taylor’s waist to shield her from the evils of fandom. They were moving in quick diva-like strides towards the exits of the Colorado Convention Center at a pace that said, “we’ve got to be somewhere and don’t have time for autographs.” Not so fast. Todd got them and then opened the door for a 10 minute photo op with other fans who noticed. I had to laugh. Update: According to Richard Prince, Taylor couldn’t get in or out of the building without encountering fans. She too was on purpose and Dyson came in to help. Todd and I split up and I decided to float with the DC Vote and DC Delegates for awhile. 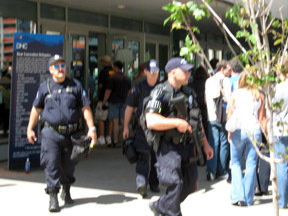 Through them I got a ride to the Pepsi Center –where I would’ve been if I was “credentialed.” Secret Service everywhere. The ones in khakis are obviously the people people – nice and polite about telling you where you’re not supposed to be. Since I wasn’t credentialed, I couldn’t join the DC delegate candidate I was traveling with inside. So I walked and walked and walked. That was when I met the news reporter who declared “there is no news here.” I was still fuming about the “credentials” snafu and not fulfilling the purpose and plan of my first political convention. Somehow this walk ended at an event for the Green Party where Colorado Green Party candidates, including Independent Cindy Sheehan (who’s running against Nancy Pelosi in San Francisco) and the Green Party presidential candidate Cynthia McKinney were among the speakers. I talked with Gael of CodePink outside organizing banners and all those creative things CodePink comes up with – never predictable. 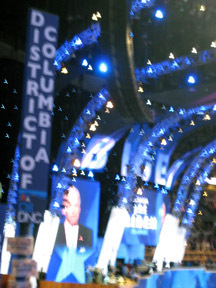 They also distributed an impressive schedule of many DNC Convention events. I met Todd at the café who was hoping to snag an interview with Cynthia McKinney and her running mate Rosa Clemente. 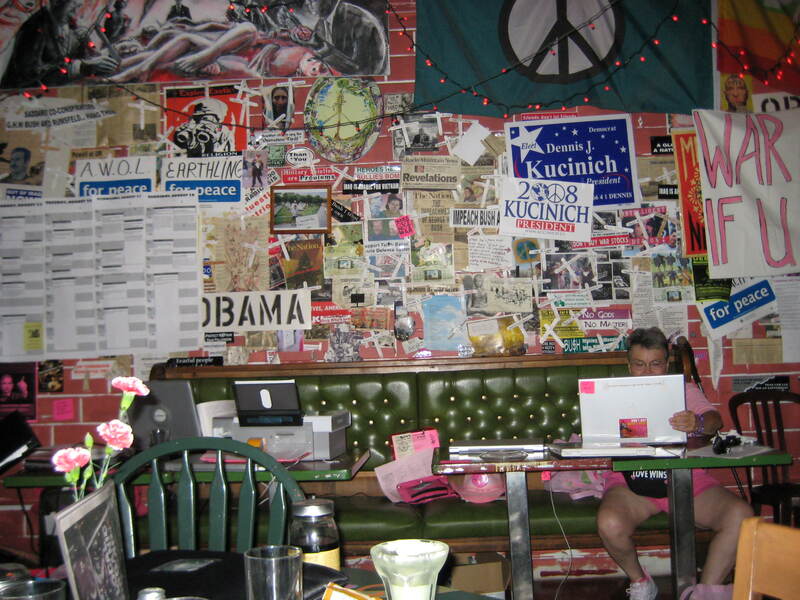 We didn’t need credentials to get into the Mercury Café, a “hippie bar” of sorts. I talked a bit with Katheen Cleaver after the event. Whoever caught me in their lens at this event, I have news. No one will be shocked to see me here. Last night we took a bus from Boulder to Denver. Yes, I’m out here in Boulder 30 miles out. Sign of how difficult it is to get a room for the convention close to Denver; but that may change later. The fact is there is bus service from Boulder to Denver. $4 each way. I think the Marc from DC to Baltimore is cheaper. However, those of us in the outerlimits of the convention, can get to downtown Denver as the very nice women at the DNC Convention table here in the Boulder hotel tells us. There’s a lot of people watching. I’m not just talking about the beefed up security with packs of impressively armed police officers and homeland security types every two blocks. I mean people watch you. I guess to make sure you’re not someone that should know, need to know, or want to know. I’ve been warned about these political events. But Denver’s going out of their way for the convention. Let’s see what this looks like in the daylight.